Looking for some inspiration on coming up with cool tattoo ideas for women? Look no further! We’ve put together some of the top tattoo ideas for women to help you make sure your next tattoo is cool, feminine, and unique. Whether this is your first tattoo or part of your ongoing collection, you’ve come to the right place to gather some inspiration. Read on to see some of our top suggestions for cool tattoo ideas for women. Flower Tattoo Ideas – Flowers are one of the most popular choices for feminine tattoo ideas, because they’re such a classic and delicate motif. Flowers are versatile and can be made to work with any size tattoo, from a small, simple tattoo, to a full sleeve of flowers. There’s no shortage of options for flower tattoo designs, as there are hundreds of flower species that could be used. Different flora have certain meanings, so depending on what kind of meaning you want for your tattoo design, you could use flowers like: roses, lilies, hydrangeas, peonies, sunflowers, tulips, daisies, poppies, and wildflowers, just to name a few possibilities. Mandala Tattoo Ideas – There are a few different meanings associated with mandalas, and these geometric tattoo designs can be combined with almost any style to make it a tattoo that’s completely unique to you. 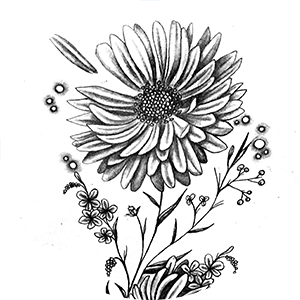 The most popular combination for mandala tattoo designs is with flowers and floral motifs, especially if you’re looking for more feminine tattoo ideas. Mandalas can be simple and small, or they can be ongoing, repeating ad infinum to make a half sleeve tattoo or sleeve tattoo. These geometric beauties can be used in combination with animals, crystals, and color to make a more complex design. Script Tattoo Ideas – Depending on what kind font you use, script tattoos can make for the perfect dainty tattoo ideas. For these kinds of tattoo ideas you can use just about anything, from personal quotes that you live your day to day life by, from lines of literature from your favorite books. Phrases from the bible, books, movies, or TV that resonate with you can be the best ideas for script tattoos, and in some cases, the simpler the better. Single lines of script are especially dainty tattoo ideas, but blocks of text done in a particularly elegant font can make the tattoo look more feminine as well. Animal Skull Tattoo Ideas – Animal skulls may not be an obvious choice, but they can be some very cool tattoo ideas for women. Certain animal skulls are better than others for tattoo designs, but it’s up to you which animal you want to use, depending on the meaning you want associated with your ink. Adding details and elements to your animal skull tattoo can alter the meaning as well, so consider some of the things that you would to combine with an animal skull to make into a more feminine tattoo design. Things like flowers, geometric shapes, stars, moons, and dotwork can contribute to the overall design of an animal skull tattoo. Animal Tattoo Ideas – Certain animals are linked with specific meanings, so if you’re looking for your tattoo design to mean something in particular, do a bit of research on which animal symbolizes what. Some of the most popular animals to be used in tattoo designs include: wolves, lions, birds, bears, cats, tigers, bats, rhinos, and elephants. Adding certain elements like flowers or geometric details can make an animal tattoo unique, so consider some small details that you like and which go with the particular animal you’ve chosen for your tattoo design. Arrow Tattoo Ideas – Arrow tattoos almost always make for dainty tattoo ideas, so if you after a particularly feminine tattoo idea, an arrow could be your best bet. Arrows may seem like a straightforward tattoo idea, but there are quite a few options for variations that you can use, such as: a single arrow, multiple arrows, script of a word making the shaft of an arrow, a heart for the tip of the arrow, an arrow piercing something, or a figure shooting with a bow and arrow. Greek Goddesses like Artemis, for instance, are linked with the bow and arrow, so figures like her with an arrow could be a good option for feminine tattoo ideas. Moon Tattoo Ideas – Moons are a great choice for particularly feminine tattoo ideas, because the moon has historically been linked to femininity. There are eight distinct phases of the moon, each of which can be used as a different phase in life, so you can use these images to mirror your own growth and life situations. The phases of the moon are: new moon, waxing crescent, first quarter, waxing gibbous, full moon, waning gibbous, third quarter, and waning crescent. Witchy Tattoo Ideas – Some of the best tattoo ideas for women have witchy elements, and this kind of tattoo design is quickly gaining popularity. Witches have some feminist associations with them, so tattoo ideas that utilize some classic witch motifs can make powerful, yet subtle, feminist tattoo designs. Witchy tattoo elements include: phases of the moon (especially crescent), bird skulls, rope, bats, broomsticks, witch hats, female figures, the triple goddess, animal skulls, plants like lavender or fern, potions, and fire. Using any combination of these motifs can make powerfully feminine tattoo ideas. There are a number of options to choose from if you’re looking for feminine tattoo ideas, and severals way to give an ordinary tattoo design a dainty twist. Some tattoo designs like flowers and arrows are more popular than others for these kinds of tattoos, but there’s no limit to what you can come with when you use a bit of creativity. Adding some of the elements mentioned above is a surefire way to achieve a tattoo design that’s distinctly feminine and meaningful to you. Do you have a feminine tattoo design? Let us know in the comments!